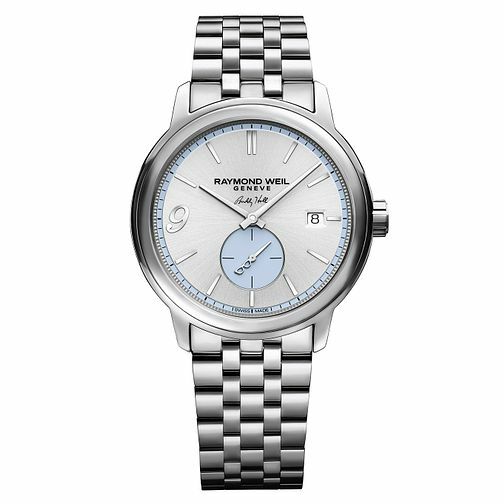 Raymond Weil demonstrates their nuanced understanding of classic watch styles with this luxury timepiece. The dial is highlighted by large Roman numerals that are surrounded by a hypnotic geneva wave pattern that anchors the piece with an intricate depth. Navy blue hands allow for enhanced readability and the subdial tracks 60 seconds with ease. The date aperture is located at the 3 o'clock mark, and the watch is Swiss-made with decades of precision in watchmaking.